Fall-off-the-bone tender short ribs are cooked slowly in a mixture of sweet, tart pomegranate juice and smoky, robust porter style beer. Bone-In Beef Short Ribs 8 lbs. Heat the oil in a Dutch oven. Generously season the short ribs with salt and pepper. Sear short ribs on all sides until browned, set aside. Reduce heat to medium and add the carrots, celery, leeks, parsnip, garlic and thyme to the pot. Sauté for 5 minutes, stirring often. Add the mustard and continue to cook for another minute. Add the beer, scraping the bottom of the pan with a wooden spoon to scrape up any browned bits; then add pomegranate juice and Demi-Glace. Bring to a boil, remove from heat and add the ribs back to the pot. The ribs should be almost completely submerged in the liquid. Cover the pot with a lid and place in the center of the oven. 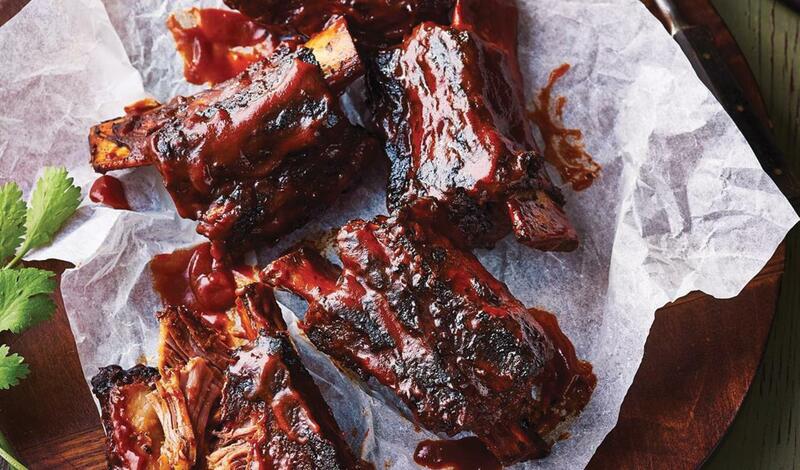 Braise for 2 ½ to 3 hours until short ribs are tender, stirring once or twice during cooking. Remove the pot from the oven and place on a burner. Carefully transfer the ribs to a serving platter and loosely cover with foil. Using a ladle or spoon, skim the fat from the braising liquid. Reduce if necessary, season with salt and pepper. Pour the sauce over the ribs, top with fresh pomegranate seeds and serve.